Malware analysis should be performed according to a repeatable process. To accomplish this, the analyst should save logs, take screen shots, and maintain notes during the examination. This data will allow the person to create an analysis report with sufficient detail that will allow a similarly-skilled analyst to arrive at equivalent results. A convenient way of keeping track of your observations during the reverse-engineering process is to use a mind map, which organizes your notes, links, and screenshots on a single easy-to-see canvas. 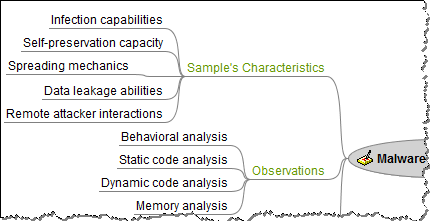 You can download my mind map template for such a report in several formats: FreeMind file (mm), XMind file (xmt) format and MindManager file (mmat). For Anuj Soni’s perspective on this topic, see his article How to Track Your Malware Analysis Findings.To learn more about malware analysis, take a look at the FOR610 course, which explains how to reverse-engineer malicious software.